As fighting between the Assad government and opposition forces continues to intensify in southwestern Daraa province, religious minorities live in fear of being persecuted by either side. Since the emergence of hard-line armed groups such as the Islamic State and the Nusra Front (Jabhat al-Nusra), several minority groups – among them Christians, Alawites, Shiites, Druze and others – have been targeted in violent attacks. 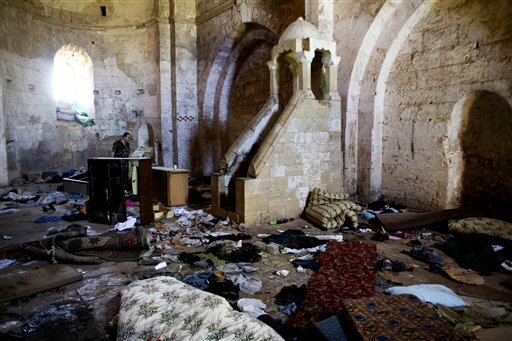 Syria's Christians, who represent around 10 percent of the country's 22 million people, have endured kidnappings, beheadings and other attacks in various parts of the country. Nour says that being a Christian in Daraa is “tough” because the community is stuck between the Syrian president Bashar al-Assad’s regime and hard-line rebel groups. “The presence of the Syrian army didn’t make any difference, although they claim to support minorities,” she explained. According to a fighter from Daraa from the Free Syrian Army’s (FSA) Southern Front unit, rebels have been working together in the area for the past two years. The Southern Front began advancing on Daraa this spring and successfully overran two of the Assad regime's local military bases. The Syrian army’s 52nd Brigade’s base is located in the Izraa district and was taken by opposition forces in March, as was the 82nd Brigade’s base in the Daraa area, one of the regime’s largest army bases, according to Basem, a 35-year-old local activist from a Syrian media center based in al-Lajat, a town in the country’s south. As these fighters continue their advance, many Syrian minority groups increasingly fear becoming the targets of violent reprisals due to the widely held belief that they are loyal to the Assad regime. According to Rami, a 29-year-old opposition activist, Assad “exploits sectarian fears in order to stay in power even as he claims to be the defender of the nation’s religious minorities against foreign Islamic extremists.” Rami also points to the fact that many local religious and ethnic minorities have been displaced during the prolonged conflicts in Syria and Iraq. Umm Michael’s 22-year-old son has already tried three times to smuggle himself into Europe, but has thus far been unsuccessful. The family have exhausted their savings trying to get him there, hoping that he can take them with him in the future. Although Christians have historically lived in relative peace beside other religious communities in Daraa, many locals say they have struggled to avoid seeming like they have taken sides. Khalil Mokhimer, media activist and founder of the Syrian Media Center in Daraa, explained that many Christians were active in the early stages of the anti-regime uprising in the city. “The Christians of Daraa – those from the city of Daraa, where the revolution was launched – didn’t have any choice but to support the revolution,” he told Syria Deeply. Mokhimer, who returned to Daraa to join the nationwide uprising that started in 2011, recalled the local churches opening their doors to the wounded when demonstrations broke out in the region that year. Some Christian areas in Daraa, such as the villages of Khabab and Basir, have largely been able to avoid the fighting. They have neither joined the uprising nor thrown their weight behind the Assad regime. An estimated 200,000 displaced Syrians have sought refuge in these villages due to their relative security, according to the Syrian Media Center in Daraa. Christians are not the only local minority who are fearful for the future in Daraa. According to Sayyed Muhammad al-Jamouseh, leader of the Ibn Mouquem al-Jawziyyah Division, part of The First Corps rebel coalition, many Shiites from the nearby al-Shaykh Maskin village fled following the Free Syrian Army (FSA) takeover of the village in December last year. Others joined the FSA. Rana Rizq is a pseudonym for a freelance journalist based in France.